Students in Iran have demonstrated against the government at Tehran University on the first day of the new academic year. 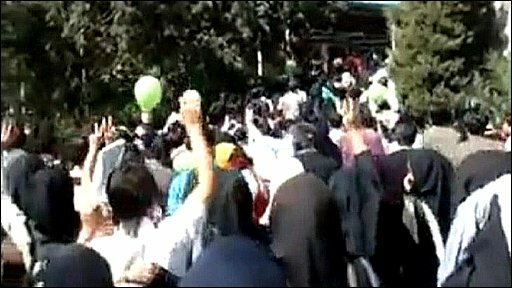 Footage posted on websites showed several hundred people chanting slogans against President Mahmoud Ahmadinejad. Eyewitnesses said students were not allowed into an official ceremony attended by a government minister to mark the start of term. Reports say a large number of police officers were in the area. One eyewitness, Mehdi, told BBC Persian that around 200-300 people had gathered in Tehran university by 1030 local time. "Demonstrators were holding up green balloons and chanting slogans such as 'Government of the coup, resign! Resign!' and 'Down with the dictator'," he said. A counter demonstration was staged by supporters of the president, who was re-elected in a disputed election in June. There were no reports of clashes between the two factions. In the aftermath of the election, Iran witnessed widespread anti-government demonstrations alleging vote-rigging and calling for a re-run of elections. Correspondents says sporadic clashes and arrests since then have underlined how deep and unresolved the crisis and divisions in Iran remain. Government and security forces have cracked down hard on the protests and have initiated mass trials of leading figures in the reform movement who supported Mr Ahmadinejad's rivals for the presidency.